INCLUDES.....WASHER & DRYER...OUTDOOR BBQ...HARD WIRED INTERNET LINE...PRIVATE FIBER OPTIC WI-FI...DISH NETWORK SYSTEM...FREE PARKING. Reserved for one or two mature adults only! Our condo has been completely remodeled and includes a new kitchen with all new appliances, a new bathroom, marble floors, granite counter tops and updated furniture! Cabo San Lucas is world famous for it's natural rock formation in the ocean known as 'The Arch'. But there is only a small area on the Corridor where you can actually see the Arch at Land's End. Misiones is located on this small stretch of beach. Enjoy spectacular sunsets and a commanding view of the legendary Arch from your over sized private terrace. In fact, this one bedroom, one bathroom unit offers an Arch view not only from the 45 ft long balcony, but also from the kitchen, living room and bedroom. Many condos claim a view of 'Lands End' but few can offer the romantic view of 'The Arch' at Land's End. The resort features a guarded, gated entrance, large swimming pool with swim up palapa bar, and 2 restaurants. The concierge can arrange most activities and can set up tee times at one of 8 nearby championship golf courses. Sunset Mona Lisa Restaurant is located on the property, providing you with a view so spectacular, you'll come back night after night. Or maybe not, since the same great ocean views are available from your private balcony. This beautiful, non-smoking corner unit features over 1000 square feet of living space including the 300 square foot covered balcony with ocean and Arch view. The full kitchen is complete with all amenities, and the bedroom features a very comfortable king size bed and flat screen TV. The living room includes a Hi Definition LED TV with a Dish Network system that receives over 100 channels plus 100 Sirius Music channels. A Brinks wall safe is included for your convenience. This fully air conditioned unit also has a washer & dryer, a high speed fiber optic line and private wi-fi. The huge covered balcony includes patio furniture to relax in and an outdoor table to enjoy meals and the fabulous sunsets. If you like to BBQ on the balcony, you'll enjoy the gas BBQ. And yes, you can hear the sounds of the ocean as you sleep at night! Both private beaches are a two minute walk from the condo, and you will never encounter annoying beach vendors here like you will on the main beaches. Costco is located less than a mile away from the condo and with Wal-Mart Super Center, City Club, and Mega Super Markets in Cabo, you'll be able to purchase almost any grocery item you can imagine. Prior to your arrival, we mail you a map of the resort and over 4 pages of useful tips and information that should answer most of your questions about the condo, the resort and Cabo San Lucas. So if you're a regular traveler to Cabo or a first time visitor, you can be confident that you'll have all the information you need to make your vacation go smoothly. Yes, Misiones is a very relaxing resort. If you like to party hard, do tequila shots by the pool, and play loud music, Misiones is not for you. However, if you want to enjoy a relaxing vacation with someone special we think you'll find our condo to be the perfect spot. We invite you to 'view comments from previous guests' to see why we think this is the nicest one bedroom condo in Cabo! Keywords: One Bedroom, Condominium, On The Beach. Lynn and I have been traveling to Cabo from California for more than 20 years and when the opportunity to purchase our condo at Misiones became available, we jumped on it. Our love for the area grew with each visit and we decided that when the time was right, this is where we would like to retire. In 2004 we purchased a 3 bedroom home in Cabo Bello, which borders Misiones. In 2006 we retired and made the move to Cabo. In 2007 we purchased a lot in Cabo Bello and built our dream home, which is where we now live. 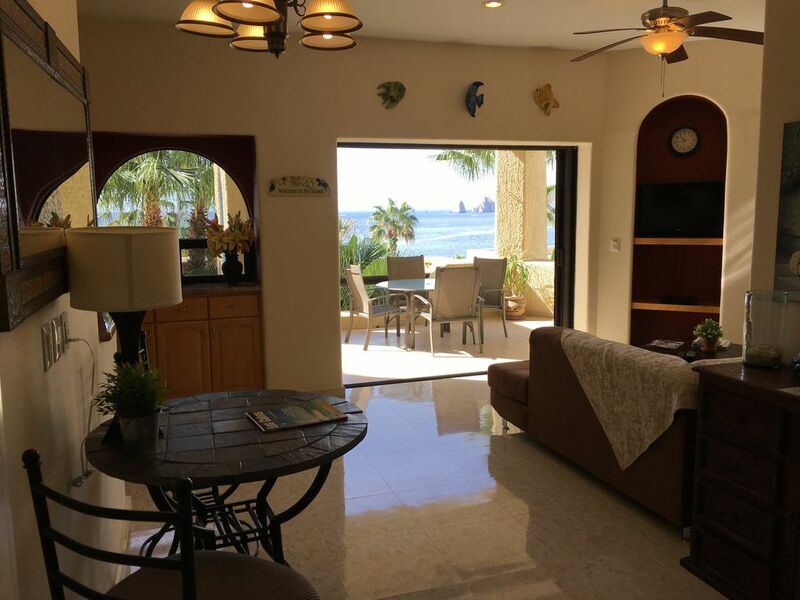 In addition to maintaining and renting our home and condo, we also help other Cabo owners with their property management and rentals. We looked at several locations in Los Cabos before we purchased at Misiones, and we found that downtown Cabo and the marina were too busy for us, and San Jose del Cabo had limited activities and benefits. Misiones is a small, quiet resort only 3 miles from town, so if we get the urge for a night out in Cabo, it's close by. But as a quiet, relaxing resort with a great ocean view of Land's End, Misiones was the perfect choice. When you first walk into the condo,one of the first things you'll notice is the great ocean and arch views from every room. Most balconies face the pool, but ours faces the ocean, which gives us more privacy, and the sound coming from the ocean sure beats the sounds coming from the pool. You'll also appreciate some of the same conveniences that you enjoy at home including private fiber optic hi speed internet, Dish Network on the living room and bedroom TV's, a washer and dryer, wall safe and a built in BBQ on the balcony. When we completed the remodel and added the new appliances and furniture, we knew we had the perfect place. In addition, the private, safe swimming beach is a 2 minute walk from the condo and there are several great restaurants within walking distance. Dish Network with HD TV. Dish Network with over 100 channels plus over 80 Sirius Music Channels. Central Air Conditioning, 2 flat screen Color TVs (receives Dish Network channels), Large Refrigerator, Mr, Coffee Coffee Maker, Toaster, Blender, T-FAL Cooking utensils, Beach Towels, Coleman gas BBQ, Iron, Ironing Board, Ceiling Fans in Living Room and Bedroom, Linens and Towels Provided, Brinks Wall Safe, Excellent snorkeling is available at the beach at Misiones, Free parking near condo.